Our quality plate stands are available as gold plate stands or standard plastic plate stands that are available in a variety of colors to match your plate or decor needs. The gold finish on the plate stands compliment our 24k gold trimmed spanish plates perfectly. 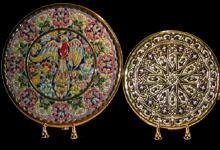 These plate stands also work perfectly to hold our clocks, small mirrors, and our decorative tiles.